I had noted this curious passage on a post long ago without knowing what to make of it. Had this this curious cousin relationship been mentioned earlier in the novel and we had missed it? Or was Proust introducing a theme here that he did not have time to develop? It came to my attention again on the Goodreads Year of Reading Proust group site. Alert reader Inderjit wondered if he had missed something. Indefatigable reader Marcellita Swann pointed him to my post, which I’m afraid does not add much. I Googled the passage to see if anyone else had any insight. I didn’t find anything except for an alternate translation of the passage. In the original Scott Moncrieff Modern Library edition, the passage is: “...the reader must now be told…”, which would favor the undeveloped theme explanation. So, is this is a translation issue, with Kilmartin changing the phrase to “the better informed reader knows“? But which is the better translation? Albertine Disparue (The Fugitive) definitely feels unfinished. Like the last 3 volumes of La Recherche it was published posthumously (and edited by Marcel’s brother, Robert Proust, and Jacques Rivière from Gallimard). We can only imagine what a few more years would have allowed Marcel to write, probably adding a few more volumes in the process. There is consequently no definitive text of Albertine Disparue. In 1986 a Proust heir unveiled a “dactylographie” where Proust had removed about 150 pages of the text, leading to a new, shorter version of Albertine, which was even less satisfying… More on this here (in French):http://www.fabula.org/cr/412.php. Re Odette & Jupien’s relationship, it was never mentioned before this passage. My sense is that Marcel talks of “notre lecteur plus instruit” (our better informed reader) by opposition to the younger people (“les jeunes gens des nouvelles générations” and “tout jeune lecteur”) who do not know precisely the complex genealogy of the aristocraty, pleasantly assuming that his reader (“notre lecteur”) knows all this as well as he does. This seems the best answer. Proust juxtaposes The “well-informed reader” to the “young reader”, which occurs both in this paragraph and a couple of pages earlier. This section of The Fugitive titled “New Aspect of Robert de Saint-Loup” deals with the constant regeneration of society. The young contemporaries just beginning to move about society tend to see the current order as fixed and ancient. Proust counters with the stories of the elevation to nobility of a tailor’s daughter to the titled Mlle d’Oloron and her marriage to the son of the engineer’s daughter and nephew of the self-styled Legrandin de Meseglise (later self-enobled to Comte de Méséglise), the Marquis de Cambremer. And with the marriage to the genuine noble Robert de Saint-Loup to the daughter of the coquette Odette. Proust developed these histories in the way described by Book Portrait, as a comparison of the views of the young and naive to those of their better informed elders: “…but many young people of the rising generation..” (V,913) and repeated in “Yet another mistake which any young reader not acquainted with…” to their more knowledgeable elders “the better informed reader…”. But the earlier explanations we came up with still holds merit. Scott Moncrieff, by changing “better informed” to “the reader must now be told” obscures, if not entirely hides, Proust’s parallel construction. And Connelly is surely correct in saying that Proust intended to further develop the Jupien-Odette cousin story. Proust gave great importance to metaphor in his novel. The problem is, as Gerald Genette has pointed out, that most of Proust’s so-called metaphors are actually metonymies. In rhetoric, a metaphor is a comparison between two seemingly unrelated objects which somehow expands our understanding of the original target object. Whereas a metonymy is a comparison between two objects that share a common space, so that our understanding is expanded by identifying close kinships. The most prominent type of metonymy in Proust is that involving spatial relations. Just consider how the two great themes of bourgeois and aristocratic life are identified as the ways by the Swann and Guermantes estates. Albertine is Balbec, the beach, the ocean. The contiguity can take other forms than purely spatial. The hundreds of painting references are mostly similarities of appearance. The problem I mention is not so much of the right rhetorical term to use. It’s that metonymy is based on objective criteria of comparison, in the way that words in a dictionary are defined by synonyms. 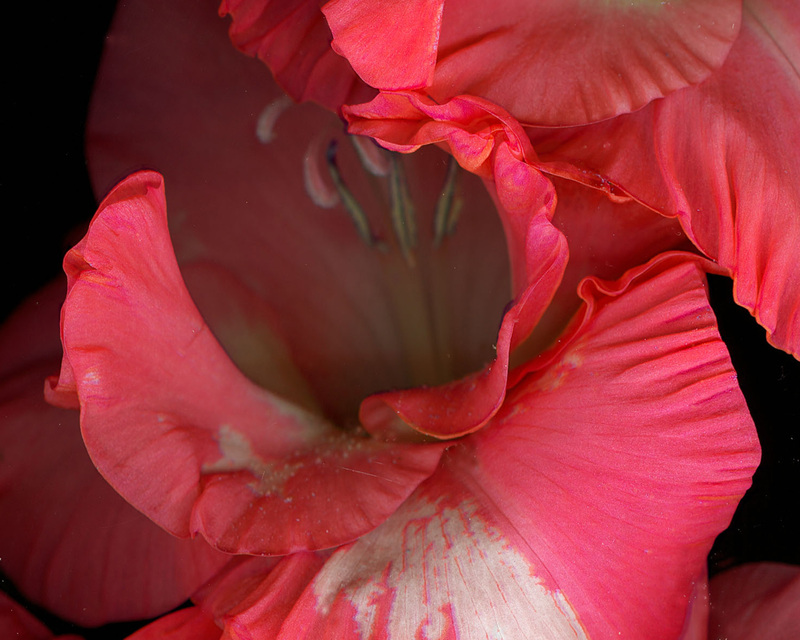 But Proust wants to reveal essence, something not easily done when comparisons reveal only established similarities. Landy admits as much but he often sees a subjective quality that reveals more. Beistegui wants to transcend these rhetorical definitions and find a more purely philosophical definition of Proustian metaphor. We saw earlier that he identifies the source of Marcel’s disillusionment in the unavoidable, necessary absence in the present, the real: “…at the heart of our relation to the world there’s a lack.” And it is this perception of absence, of incompleteness in perceived reality that creates the need for metaphor. Metaphor completes the merely real thing. In just this sense metaphor arises in the nature of being, is ontological. One element is still missing before metaphor becomes art: style. Finally, there is the question of the permanence of metaphor, its persistence in time. What is the source of the joy that arises from episodes of involuntary memory? While originating in the senses, the sensation itself cannot be the source, however pleasant the taste of the tea and cake. Nor is it in the evoked memory, the dull visit with your hypochondriac aunt. Beistegui’s paradox number 1: Joy comes not from the senses but from essence. Paradox number 2: Joy comes not from perception but from recollection. Paradox number 3: Joy only ever happens the second time around. 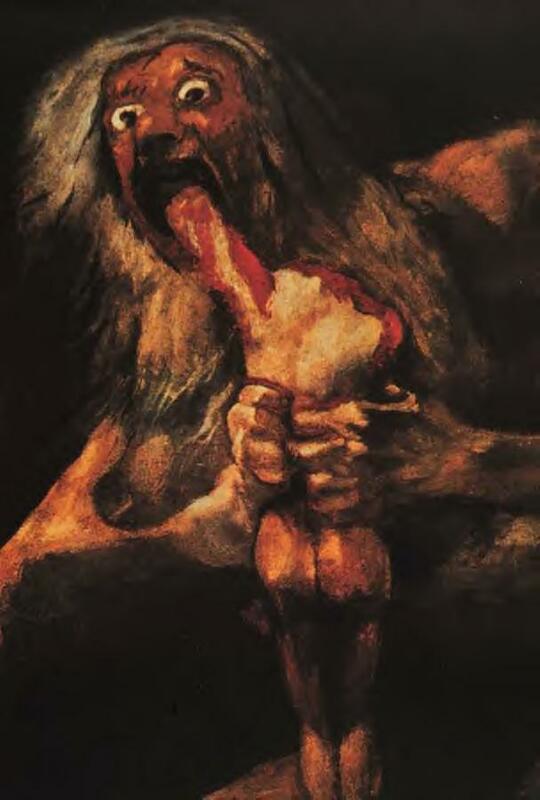 The Titan Kronos eating his children by Goya. Beistegui devotes a chapter to the psychology of memory, especially the associationist school that was prominent in the nineteenth century. Wikepedia: Associationism is the idea that mental processes operate by the association of one mental state with its successor states. Most important to Proust’s thought was Hippolyte Taine (apologies to Bergson). 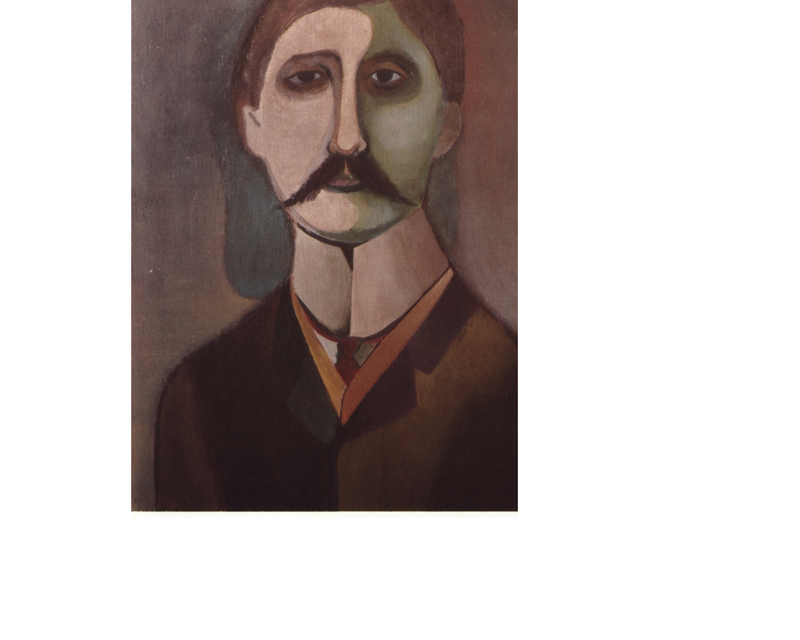 In Search of Lost Time depends on a theory of memory that involves Proust in a conversation with the psychologists and philosophers of his time, Taine, Ritbot and Bergson in particular. For example, his critique of the view that it’s “intelligence” that affords us access to the truth of the world and to our experience of it, as well as the positive role that he gives memory in all this, wouldn’t have been possible without the ideas developed in On Intelligence (De l’intelligence), in which Taine defines intelligence as understanding or as intellect, i.e. as the faculty of knowing. The associationists recognize the same three types of memory as Proust. The second is voluntary memory, the one so despised by Proust. The third and final form of memory is involuntary. Proust goes beyond associationists here, making it the foundation of his aesthetics. They were just passing a hawthorn bush, it could scarcely be called a tree, which was putting out, amid its healthy shining thorns, sharp little vivid green buds. Murdoch inverts Proust’s hawthorn scene: In the absence of art the hawthorn is all thorns, a ragged bush. The arc of ISOLT might be described as a long chain of disillusionment followed by a triumphant, joyful epiphany. Miguel de Beistequi, in Proust as Philosopher, The Art of Metaphor, breaks this arc into the stages of looking for, finding and giving joy. Just how metaphor has this power is the subject of de Beistegui’s book (and in this blog here, here, here and here). As examples of the lack at the heart of reality, de Beistegui looks at the objects of Swann’s and Marcel’s desires: Odette and Albertine. Proust intentionally gives us portrayals of these two characters that reveal little of their inner selves. We are meant to see them as the rest of the world does, as shallow figures inexplicably worshiped by their lovers. But their lovers have augmented reality with their imaginations. Reality lives in the present, in the realm of impressions where we must act, and which requires augmentation by imagination. Can reality be expanded so that it can be enjoyed? The literary problem the young Marcel must solve is to find a way to unite sensuous joy with the permanence of art. Unable to sleep in an unfamiliar guest room, I pulled a book down from the library shelf, Why New Orleans Matters by Tom Piazza. I opened it and serendipitously read the following passage where the author cites the noted musicologist Dr. John to restate Proust’s central aesthetic concern. Metaphor is not limited to a rhetorical device; it can be a very physical, time erasing bridge from the present moment to our most intensively lived past, to essence. Mac Rebennack, better known as Dr. John, once told me that when a brass band plays at a small club back up in one of the neighborhoods, it’s as if the audience–dancing, singing to the refrains, laughing–is part of the band. They are two parts of the same thing. The dancers interpret, or it might be better to say literally embody, the sounds of the band, answering the instruments. Since everyone is listening to different parts of the music–she to the trumpet melody, he to the bass drum, she to the trombone–the audience is a working model in three dimensions of the music, a synesthesic transformation of materials. And of course the band is also watching the dancers, and getting ideas from the dancers’ gestures. The relationship between band and audience is in that sense like the relationship between two lovers making love, where cause and effect becomes very hard to see, even impossible to call by its right name; one is literally getting down, as in particle physics, to some root stratum where one is freed from the lockstep of time itself, where one might even run backward, or sideways, and something eternal and transcendent is accessed. (Why New Orleans Matters, page 25). 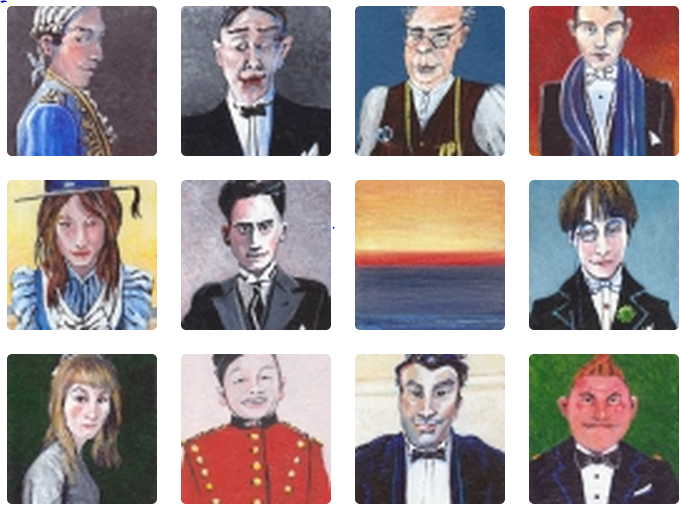 David Richardson has recently published the portraits of many of the characters appearing in ISOLT. The book is a limited edition (translation: very expensive) and the production quality is very high. 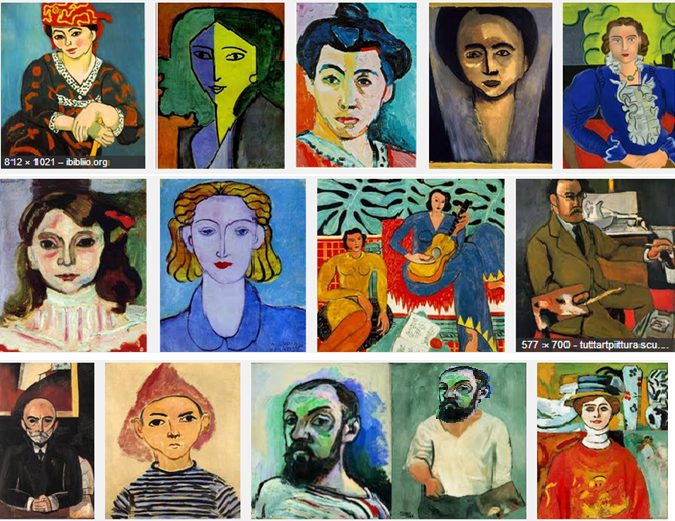 Richardson is a vibrant colorist, recalling to my mind the portraits of Matisse. I have copied a few random portraits from each artist for you to make the comparison. The title of Anka Muhlstein’s new book, ‘M. Proust’s Library’, at first struck me as odd, since Proust did not have much of a book collection. Proust seems to have committed large sections of whatever he read to memory, making the ownership of books superfluous. But she has the wider meaning of library in mind. One of her threads helped me to better way frame the famous madeleine incident. Proust’s Search can actually be condensed quite a lot once we ignore all the Marcel flashback stuff. A middle-aged man, in anguish over how to become a writer, has a pleasant glow of reminiscence after the taste of a pastry dipped in warm tea creates a kind of space-time wormhole to his childhood. But the glow fades. He takes a walk in the Bois in order to bring back more of these unforced memories. The walk ends in gloom as he is reminded simply of the loss of beauty in his life. He visits a childhood friend—but their conversations do not show him a way forward as an artist. He commits himself to some sort of asylum for renewal, which he interrupts to take a short trip to Paris during the war years. He sees startling events, but still cannot figure out how to knit them together into a narrative. Years later he returns to Paris again and accepts an invitation to a soirée filled with characters he had known throughout his childhood and youth. It is here that everything changes. So this book-inspired unforced memory, about a country waif adopted by (and later married to) a woman named Madeleine, is the more powerful of the madeleine stories, touching as it does not only on Marcel’s artistic breakthrough and its source in literature, but also Proust’s deepest psychological nature.